POMPEY have been warned: Beware the Beast. Andy Awford’s men are set to be tasked with taming the monstrous power of AFC Wimbledon striker Adebayo Akinfenwa on Boxing Day. Akinfenwa, nicknamed the Beast, is hoping to be available to face the Blues after limping off against Mansfield on Saturday. And a place in the Dons’ team will give the Pompey defence nearly 18 stone of hulking muscle to contend with. 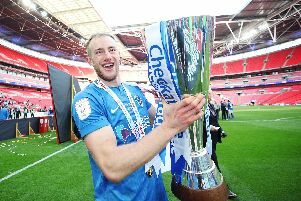 The 32-year-old is someone midfielder Danny Hollands knows all about from his time at Gillingham last season. Hollands feels the Blues back four are going to have their hands full looking after the ultimate striking powerhouse. He said: ‘I’ve played with Bayo and it’s not just goals with him. ‘He’ll take a chance but he is a handful. ‘I played with him for a bit last season and he is just so strong. ‘With his hold-up play he’s one to watch. But if you go through their squad you can see they have good players. ‘I’ve also played with Adam Barrett and a few of the other lads. For this level they are very good players. ‘I’m surprised they’ve had the lack of consistency, but we’ve been the same. As well as Akinfenwa, Pompey target Matt Tubbs will also be under the microscope after smashing in 13 goals this term. He’s another player Hollands knows about from their time together at Bournemouth. Hollands said: ‘It’s a classic big man, little man thing. ‘Not all sides go with that these days but it’s worked well for them. ‘I played with Matt Tubbs at Bournemouth. He’s a good player. He’s proven at this level and will score goals. ‘So he’s one we have to keep an eye on. ‘If you have a striker who scores 20-plus goals it’s a big help. ‘To have 13 at this stage is some going, so obviously he’s someone to watch. Hollands is after a minimum four points from the festive period to get Pompey motoring as they enter 2015. He said: ‘It was a good point Saturday. Now we have two tough games against two strong teams. ‘AFC Wimbledon have not had as strong results of late, but if you look at their team you know it will be a tough test. ‘If we win that it will be fresh in the minds to take into the next game. ‘If we can get four or even six points that would be a great return, and we would have caught up on some of the pack in front. ‘No one is running away with it. So that shows if you put a run together for three or four games you are right in it. ‘If we can have a good period that will put us in a good place as we move towards the business end of the season. ‘This is where you have to start putting everything together and make sure you are picking up the points.